There’s a scene in Tomorrowland where the main character fights off some robots in a pop culture store. As they crash through the racks of merchandise, firing laser pistols in wild abandon, the barrage of pop culture images and sound effects play out like a homage to the history of science fiction. We hear the familiar squeal of R2-D2 seconds before a character crashes into a statue of the Iron Giant. Star Trek posters adorn the walls. Rock’Em Sock’Em robots fill the shelves. It is a garish concentration of pop culture ephemera, designed to delight the fans. And that’s what Tomorrowland is all about: nostalgia. It is a glimpse into the forgotten worlds of retrofuturism, where chrome jetpacks and airliners dominate the skies, and gleaming skyscrapers are skirted with radiating flanges. It is about everything that science fiction promised, yet failed to deliver. Unfortunately, this failure to deliver extends to Tomorrowland itself. It is a spectacular and rollicking ride, but it offers very little serious commentary on its subject. For a film that is supposedly focused on the future, it is mired in the past. I’d been waiting to see this film since the first enigmatic teaser trailer (embedded above). But I was disappointed to hear that it hadn’t received favourable reviews. Director Brad Bird’s previous films have been quite enjoyable, and the retrofuturism he employed in The Incredibles makes him well-suited to a project like Tomorrowland. So I went into the film with low expectations, but hoped to be surprised. The story follows Casey (Britt Robertson), a dreamer who is sabotaging NASA’s attempts to close down their launch platforms. Casey is given a glimpse of Tomorrowland, a futuristic city where the brightest engineers and inventors and working to make the world a better place. 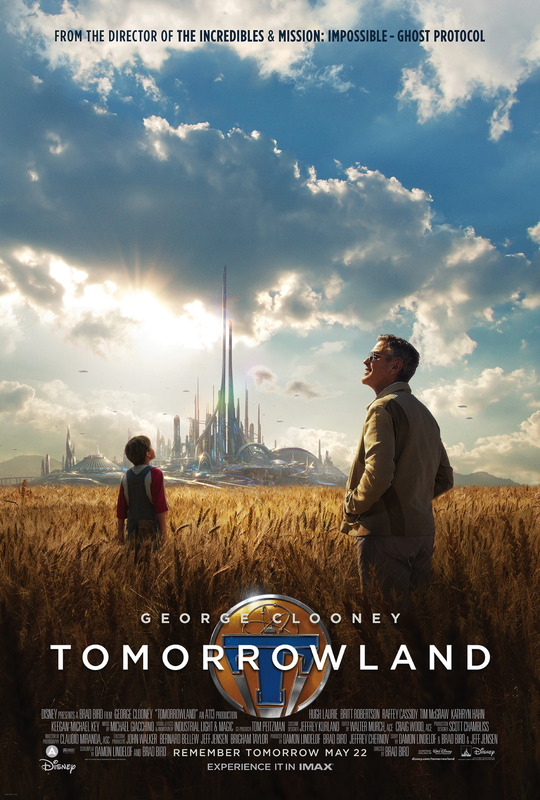 She unites with the inventor Frank (George Clooney) and recruiter Athena (Raffey Cassidy), as the three of them attempt to make the perilous journey to Tomorrowland. Once there, they must save the world from an apocalyptic future, one that is constructed as the pessimistic alternative to Tomorrowland’s optimistic techno-utopia. I came away from the cinema feeling hopelessly optimistic. This movie wants you to believe that the future can still be a shiny utopia, rather than the depressing slide back to barbarism that we’ve seen in recent apocalyptic films. It is a film that unashamedly examines the history of science fiction ideas, and this is the main reason I enjoyed it – it spoke directly to my (admittedly narrow) interests. I’ve written previously about the concept of Golden Age nostalgia, but Tomorrowland takes this to a very literal level, nostalgic for the actual Golden Age of science fiction. There were so many moments in the movie that spoke to my inner fan. A sequence in the middle of the film involves the “true purpose” behind the Eiffel Tower, a sort of science-fictionalized conspiracy involving Jules Verne, Gustave Eiffel, Nikola Tesla, and Thomas Edison. Perfect! And if that’s not enough science fiction references for you, there’s even a character named Hugo Gernsback. Really, Brad Bird? Keegan-Michael Key as Hugo Gernsback in the “Blast from the Past” pop culture store. It’s the aesthetic of Tomorrowland that really stands out. The first glimpses of the city, from a distant wheat field, deliberately invoke the Emerald City from The Wizard of Oz. The scenes in the city recall the pulp imaginings of Frank R. Paul. The population look like the idealized human image from the 1950’s – young, clean-cut, multicultural. The film even parodies itself in this aspect, with the sinister robot assassins looking hilariously resplendent with their slick Brylcreem hairdos and pearly white smiles. It’s like a bizarre mix of Mad Men and The Jetsons. However, the film definitely has its flaws. 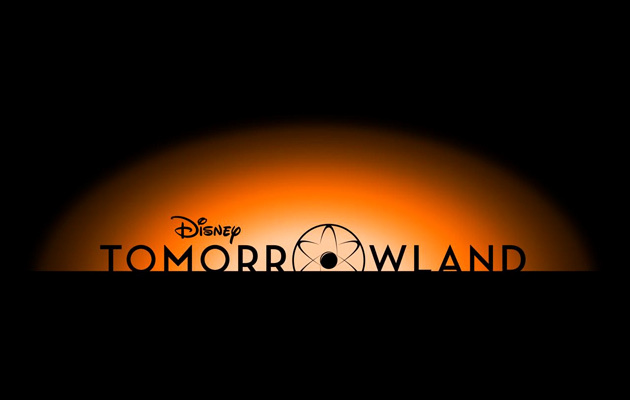 The middle third of the film dragged for too long, as the characters overcame obstacles in their quest to return to Tomorrowland. The whole Joseph-Campbell-Hero’s-Quest surrounding Casey felt tired and unnecessary, almost undermining the film’s message that all of us need to embrace hope to save the future. If I didn’t have a critical interest in the pulp imaginings of early science fiction, I don’t think I would’ve have enjoyed this film as much. But it’s also my critical interest in the subject that led me to my biggest problem with the film. This is what the future will look like as long as we dream and hope hard enough. It’s easy to compare this film to Chris Nolan’s Interstellar – they both yearn for the optimistic visions of yesteryear. Both films mourn the fact that humanity is no longer reaching for the stars. And both films capitalize on a nostalgia for Golden Age science fiction. But where Interstellar recaptures the heroic engineering feats of an early Heinlein novel, Tomorrowland reaches back even further, feeling like a rollicking pulp adventure that we may have encountered in the early days of Amazing Stories. We have the boy genius, the whizz-bang gadgetry, the hopeless optimism about the future. And this future is in reach – we just have to learn how to dream again! Parts of the movie feel like they’re straight out of Hugo Gernsback’s Ralph 124C 41+, with a techno-utopian vision that can be achieved through feats of engineering and good old-fashioned gumption. But a text that offers a much more critical examination of the subject is William Gibson’s 1981 short story “The Gernsback Continuum.” This story actually feels like a critique of Tomorrowland, even though it was written over thirty years earlier. It follows a photographer who is tasked with capturing examples of retrofuturistic architecture – those old American diners that are modeled on rocket ships, gas stations ribbed by chrome rings, “ephemeral stuff extruded by the collective American subconscious of the Thirties…” During his assignment, he begins to catch glimpses of this alternate future, “semiotic ghosts” that flicker at the periphery of his vision. The story, like Tomorrowland, contrasts the future envisaged by Gernsback and his contempories with the harsh realities of the real world. What Tomorrowland fails to realize is that the very dream it tries to capture is the same dream that led society towards this nascent dystopia. In the pursuit of an idealized world, consumer desire for bigger and better things helped sustain the same industries that blackened our skies and poisoned our atmosphere. As Gibson wrote, those rocket ships became V2 rockets and ICBMs. While we dreamed of flying cars and gleaming cities, reality was already corrupting the foundations of that dream. Towards the end of Tomorrowland, a character laments our society’s fixation with apocalyptic narratives. We are almost made to feel guilty for enjoying the genre. This is what ultimately disappointed me about the film: it was so open-heartedly earnest about embracing its utopian vision that it doesn’t pause to consider the downside of its dream. I love my science fiction to be socially aware, but Tomorrowland doesn’t engage with the real issues behind the film. It beats us over the head with images of the coming apocalypse, but for all its brash adventuring, it doesn’t offer anything else except a return to the past. It suggests that the solution to the problems of the future (climate change, fuel shortages, disease, etc) can be found by embracing the dreams of yesterday. It blithely ignores the fact that these dreams were the root of the problem. It’s good to dream, but at some point we need to wake up. No, it’s the opposite of that. Bird has been clear, in interviews, that each generation of dreamers gets the vision of the future city that fits their era, only a little ahead. This is evident in the prequel, when those who get the comic-book and special glasses at the 1939 World SF Convention see a 1950s city. In the movie, Casey gets the 1964 version of the vision which imagined the late 1980s version of the city. 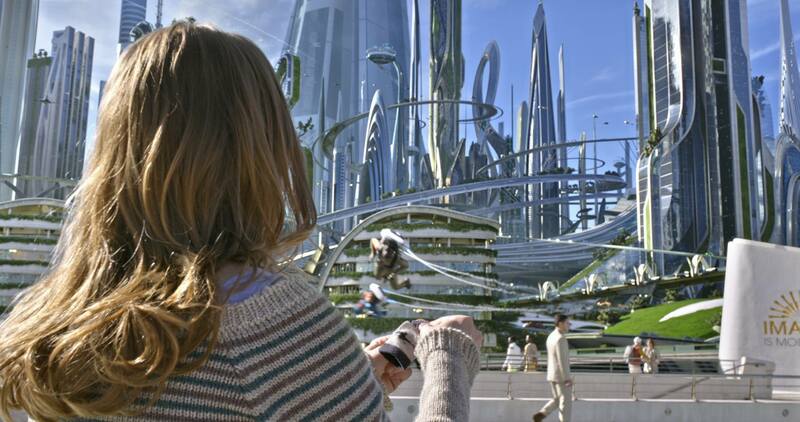 The new dreamers of the 2010s presumably get the vision of the flowing organic eco-city of the 2040s, that can be seen in most especially in some of the movie’s pre-production concept art. 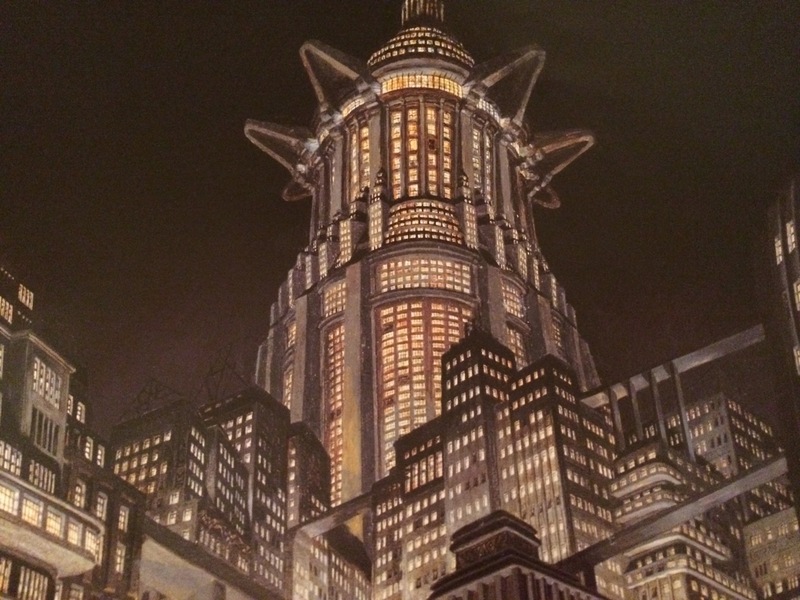 This ever-shifting conception of the ‘future city’ is echoed in the changing art styles and slightly changing cities that can be seen in the credits at the end of the movie. Subliminally, this sub-theme perhaps also echoes the ever-changing creative destruction and re-invention of theme-park attractions (the movie is of course partly based on such). All of the above also reflects a key plot point, for those who know the back-story from the prequel novel (Tomorrowland can only really be understood on a critical and thematic level is approached as a transmedia work – two novels, comic, website, movie, deleted scenes) – that the city itself was born from a 1930s pulp artist’s sketch which was saved and cherished by a reformed Nazi android, who actually built the imagined dream city. The never-opened-to-the-public Tomorrowland ‘city’ is thus a metaphor for the human imagination on the stage-set of the possible, for our ability to rationally imagine the future and inspire people through creative visions of what is possible. Visions plural, because if the future becomes a Nix-only one-man vision then it inevitably shrivels and dies. What Plus Ultra is fumbling toward through its false-starts in 1939 and 1984 is that the future should be an open work, one that’s always on the horizon if we’re all helping make it, a place that we see and try to get to, but its always inevitably in the process of becoming another vision-city in a further future. So Tomorrowland is not at all a movie telling us to embrace nostalgia for yester-year – in fact there are several plot points that counter that sentiment, not least the scene with the ‘evil hippies’ nostalgia-store owners.